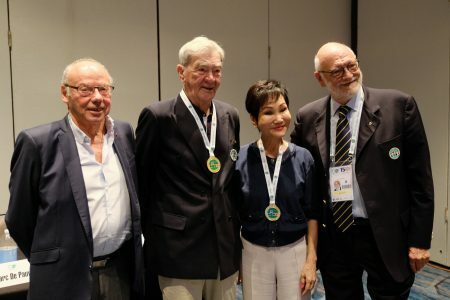 On the 27th of September, during the WBF Congress, the President Gianarrigo Rona awarded Mrs. Esther Sophonpanich, President of Zone 6, and John Wignall, retiring President of Zone 7, with the WBF Gold Medals. The World Bridge Federation awards a Gold Medal to individuals or in some cases to Federations or other associations, in recognition of their great service to the World of Bridge. Thanks Esther and thanks John for your great effort!